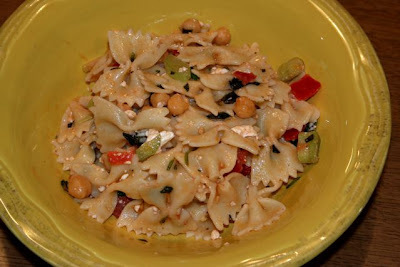 This is a nice warm pasta salad with bowtie pasta, feta cheese, sautéed garbanzo beans, and tomatoes. She even took my lead and added some fresh rhubarb for a tart crunch. Nice light vegetarian meal. When she has time she can follow a recipe pretty well. 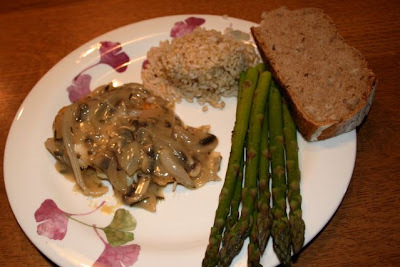 Here is a chicken breast with a mushroom and white wine sauce. Brown rice, asparagus and some of my freshly made whole wheat onion sourdough bread accompanied the meal. 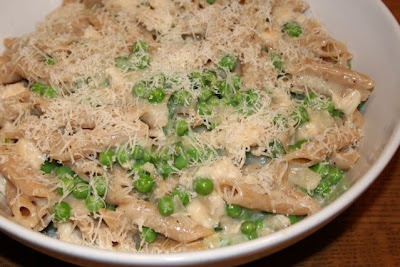 Nothing says spring like fresh peas. Unfortunately I don’t have fresh peas but these organic frozen peas sure were sweet. I made a quick and dirty dinner with whole wheat penne pasta. I cooked up some onions and garlic in olive oil, added some chopped chicken breast to it. Once that was almost cooked through in went a bunch of frozen peas. I made a sauce using a couple tablespoons of flour mixed with a cup or so of skim milk. 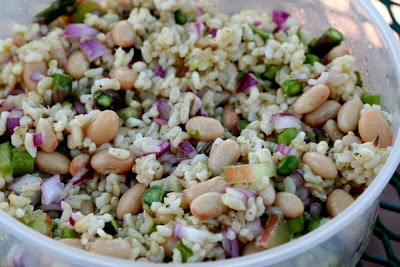 This was added to the chicken and peas along with a half cup of fresh chopped tarragon from the garden. The cooked pasta was tossed with this mixture and topped with freshly grated parmigiano reggiano. It was YUMMY. I felt in the mood to bake some bread. 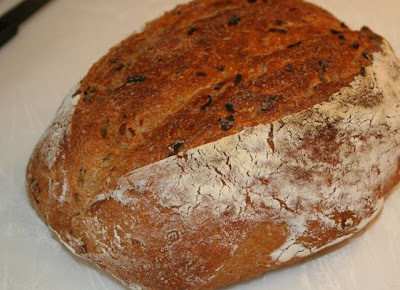 This was very similar to the whole wheat onion sourdough no-knead bread I made last fall. The proportions were probably a little bit different. It rose better this time and came out with a very nice texture. The crust was PERFECT baked in my Le Creuset iron pot. I split it quite deeply right down the middle just before baking and it sprang open just beautifully.